Jesus (c. 4 BC – c. AD 30 / 33), also referred to as Jesus of Nazareth and Jesus Christ, was a first-century Jewish preacher and religious leader. He is the central figure of Christianity, and is widely described as the most influential person in history. Most Christians believe he is the incarnation of God the Son and the awaited Messiah (Christ) prophesied in the Old Testament. Virtually all modern scholars of antiquity agree that Jesus existed historically, although the quest for the historical Jesus has produced little agreement on the historical reliability of the Gospels and on how closely the Jesus portrayed in the Bible reflects the historical Jesus. Jesus was a Galilean Jew who was baptized by John the Baptist and began his own ministry. He preached orally and was often referred to as "rabbi". 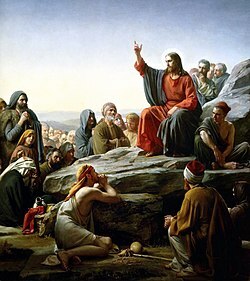 Jesus debated with fellow Jews on how to best follow God, engaged in healings, taught in parables and gathered followers. He was arrested and tried by the Jewish authorities, turned over to the Roman government, and crucified on the order of Pontius Pilate, the Roman prefect. After his death, his followers believed he rose from the dead, and the community they formed eventually became the early Church. The quest for the historical Jesus consists of academic efforts to determine what words and actions, if any, may be attributed to Jesus, and to use the findings to provide portraits of the historical Jesus. Since the 18th century, three scholarly quests for the historical Jesus have taken place, each with distinct characteristics and based on different research criteria, which were often developed during each specific phase. These quests are distinguished from earlier approaches because they rely on the historical method to study biblical narratives. 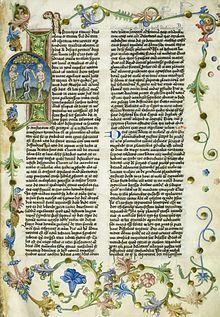 While textual analysis of biblical sources had taken place for centuries, these quests introduced new methods and specific techniques to establish the historical validity of their conclusions. This is a bibliography of works with information or interpretations of the life and teachings of Jesus. The list is grouped by date, and sorted within each group (except for the very earliest works) alphabetically by name of author. 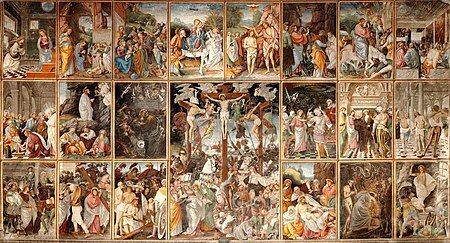 The Life of Christ as a narrative cycle in Christian art comprises a number of different subjects narrating the events from the life of Jesus on earth. They are distinguished from the many other subjects in art showing the eternal life of Christ, such as Christ in Majesty, and also many types of portrait or devotional subjects without a narrative element. The ascension of Jesus (anglicized from the Vulgate Latin Acts 1:9-11 section title: Ascensio Iesu) is the departure of Christ from Earth into the presence of God. The biblical narrative in Chapter 1 of the Acts of the Apostles takes place 40 days after the resurrection: Jesus is taken up from the disciples in their sight, a cloud hides him from view, and two men in white appear to tell them that he will return "in the same way you have seen him go into heaven." 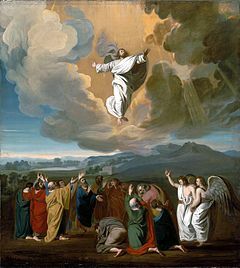 In the Christian tradition, reflected in the major Christian creeds and confessional statements, the ascension is connected with the exaltation of Jesus, meaning that through his ascension, Jesus took his seat at the right hand of God: "He ascended into heaven, and is seated at the right hand of God the Father Almighty." In modern times the Ascension is seen less as the climax of the mystery of Christ than as "something of an embarrassment", in the words of McGill University's Douglas Farrow. The religious perspectives on Jesus vary among world religions. Jesus' teachings and the retelling of his life story have significantly influenced the course of human history, and have directly or indirectly affected the lives of billions of people, even non-Christians. He is considered to be the most influential person to have ever lived by many, finding a significant place in numerous cultural contexts. The Gospel of John (Greek: Εὐαγγέλιον κατὰ Ἰωάννην, translit. 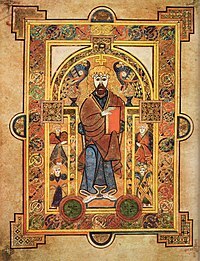 Euangélion katà Iōánnēn) is the fourth of the canonical gospels. The work is anonymous, although it identifies an unnamed "disciple whom Jesus loved" as the source of its traditions. It is closely related in style and content to the three Johannine epistles, and most scholars treat the four books, along with the Book of Revelation, as a single corpus of Johannine literature, albeit not from the same author. 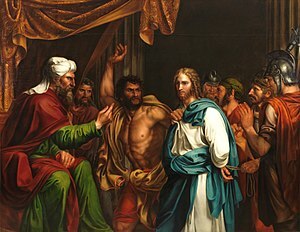 Jesus about to be struck in front of the High Priest Annas, during his Sanhedrin trial, depicted by Madrazo, 1803. The Four Evangelists by Jacob Jordaens, 1625–30, Louvre. ... that Kentucky family court judge Timothy N. Philpot says he does not "mention Jesus inside the courthouse very much, even when I know he is absolutely the only answer to the problem in front of me"? ... that Bob Dylan's "Nothing Was Delivered" has inspired interpretations ranging from a failed drug deal to Judas Iscariot's betrayal of Jesus? ... that followers of the second-century Carpocratian Christian leader Marcellina venerated Greek philosophers alongside Jesus? ... that the Episcopal Seminary of Fiesole, formed after the Council of Trent, was unusually influenced by the Society of Jesus? ... that Thomas F. Mulledy sold the slaves owned by the Maryland province of the Jesuits in 1838 in order to pay off its debt? Do you have a question about Jesus that you can't find the answer to? 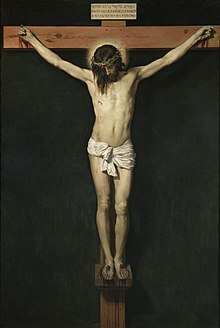 For editor resources and to collaborate with other editors on improving Wikipedia's Jesus-related articles, see WikiProject Jesus.